This charming church is set at a bend in the busy A1120 road, which threads its unfortunate way through what is otherwise a pretty village. There is a village green and a fine pub, although the famous Earl Soham Brewery now brews its excellent beer at the bottom of my road in Ipswich. The tall west tower faces the road, the wings of the church folded in behind it and set in what is a deceptively sylvan churchyard. There are no aisles. The best towers in East Anglia are late 15th Century, and this is one of them. You can even make out the inscriptions naming the donor and the mason high up on the west buttresses. St Mary underwent a late and theologically articulate High Church restoration in the last years of the 19th Century under the watchful eye of Richard Abbay, who was Rector here for almost half a century. Abbay was a creative and energetic man, and every part of this church shows his impress. His is the inscription on the south porch, a modern translation of a medieval invocation, Christ who died upon the rood, grant us grace our end be good. The medieval figure on the porch pinnacle was probably set here by him - Mortlock thought it might be St Andrew. The nave was rebuilt at about the same time as the tower in the 15th Century, and has an excellent contemporary double-hammer beam roof, unusual in what is a relatively small church. The font is probably contemporary with the rebuilding of the nave, although the general feel is of a well-kept late Victorian church. Many of the benches are, in fact, medieval in origin, but in most cases completely restored. The bench ends were mostly produced in the early 20th century under Richard Abbay's direction by a group of parishioners taught by Archdeacon Darling, the woodworking Rector of Eyke. As at other churches where such things are found - Worthham and Hollesley spring to mind - they are a delightful collection, giving an insight into the imaginations and interests of Earl Sohamers of a century ago. An old woman binds a stook of corn and a man carries a basket from the Labours of the Months, and there are a number of other rural subjects. An old man sits in a big coat and a bowler hat, perhaps in the snug of the local pub. Some are animals, some copies of more famous medieval bench ends at Blythburgh and Ixworth Thorpe. It must be said that some are rendered with more enthusiasm than skill, but they are all the more charming for that. A few are genuinely medieval. The real star of the show at Earl Soham also concerns Richard Abbay, but post-dates the bench ends by half a century. This is a window, one of the very last commissions of the great Margaret Edith Rope. 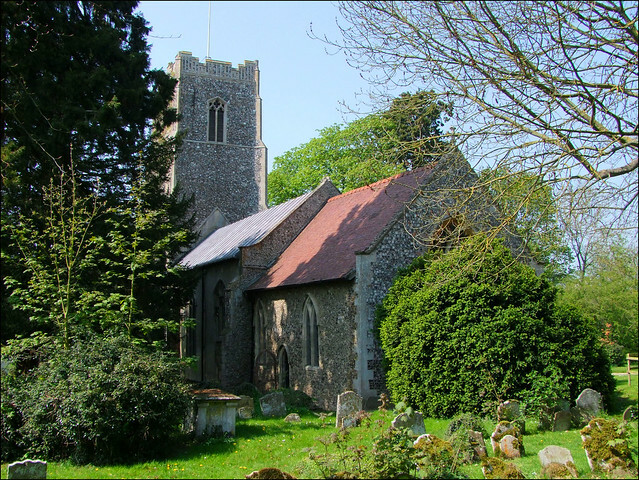 In 1967, she produced the figures of St Edmund and St Felix, Suffolk's two major early medieval Saints, to commemorate the lives of Canon Abbay and his wife Janet, as well as to remember their grandson who was killed in the Second World War at the age of 25. The lines are fresh and young, the colours vivid and vibrant, and it is extraordinary to think that Margaret Edith Rope was already in her late seventies at the time she produced it. I found it very moving, not least because, quite by coincidence, I had the previous afternoon visited Clippesby church in Norfolk, where one of her very first commissions, of 1919, is set. And yet here still were the youthful details, the East Anglian flowers she loved, the near-comic book joy in the face of Christ in Majesty in the top light. Breathtaking. The freshness of Margaret Edith Rope's window lends something of a ponderous feel to the church's other major window, by Burlison and Grylls beneath the tower. The main subject is the Host of Angels appearing to the shepherds, but the real delight is the pair of vignettes beneath, one showing Christ healing the High Priest's ear, an unusual subject, and the other a splendid, stately Noah's Ark breasting the waves as Noah releases a dove. The crucifixion, slightly earlier glass in the east window, is poor in comparison. The royal arms are to Charles II, set here at the time of the Restoration in celebration of the end of the Commonwealth. Even so, this was perhaps not entirely celebrated here in puritan Suffolk. To finish, two reminders of Britain's colonial role in India face each other across the nave. Charlotte Colvin was the wife of Sir Auckland Colvin of the Indian Civil Service. She died in 1865 at the age of 28 at Roorkee in the North West Provinces of India. Meanwhile, a charming Art Nouveau lead and pewter memorial recalls a Captain in the 87th Punjabi Regiment killed half a century later. He was Marmaduke John Norman Abbay, the son of Richard and Janet Abbay. He died in France on May 10th 1915 from wounds received at Ypres. he was 29 years old. The memorial, almost certainly designed by Richard Abbay, records that he Gave his Life for his Country, his Soul to God. That must have been small comfort, even then.